the diorama as pictured measures approximately 30" x 19"
the story...Back in early 2004 Boone Morrison and I were discussing the possibilities of producing a kit based upon the Sturgeons' Sebastopol California sawmill since my O scale sawmill equipment so closely resembles that from the prototype. Not to mention the mill is the perfect design for a model! Well as with many projects it got shelved for one reason or another... Then in the Spring 2007 Finescale Railroader Logging and Mining Annual showed up with an article by my buddy Martin Jones. 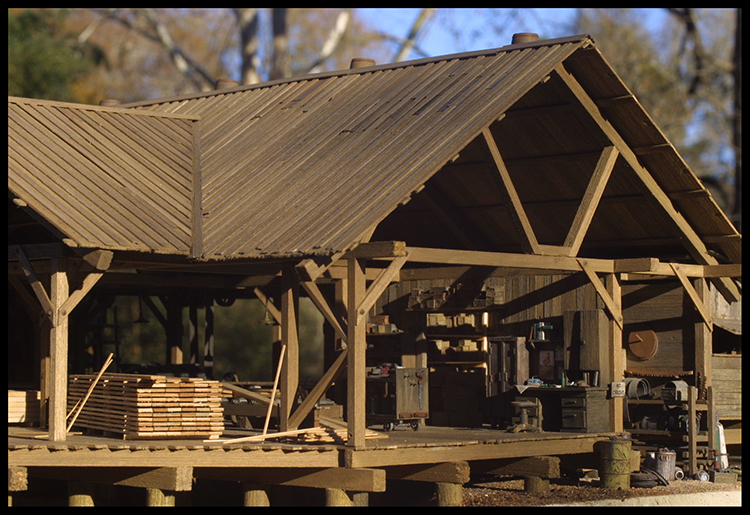 It featured his wonderful sawmill constructed using Boone's plans and my sawmill machinery kits. That re-ignited the spark to produce this kit and the rest is as they say history! 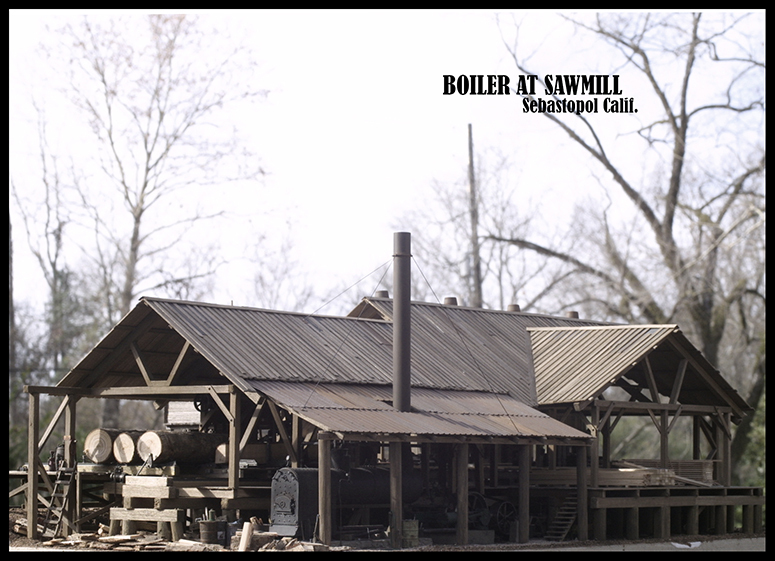 A backwoods O scale sawmill based upon the plans drawn by Boone Morrison of the Sturgeons' Sawmill located in Sebastopol, California. Suitable for a wide date range from the late 1800's to the 1940's and even beyond. This project would not be possible without help from my friends Karl Allison, Doug Ramos, and Marty Jones. This kit is a huge undertaking and is available in very limited quantities. Please allow extra manufacturing time when ordering. Be sure to call Brett at 972-618-5563 if you have any questions! 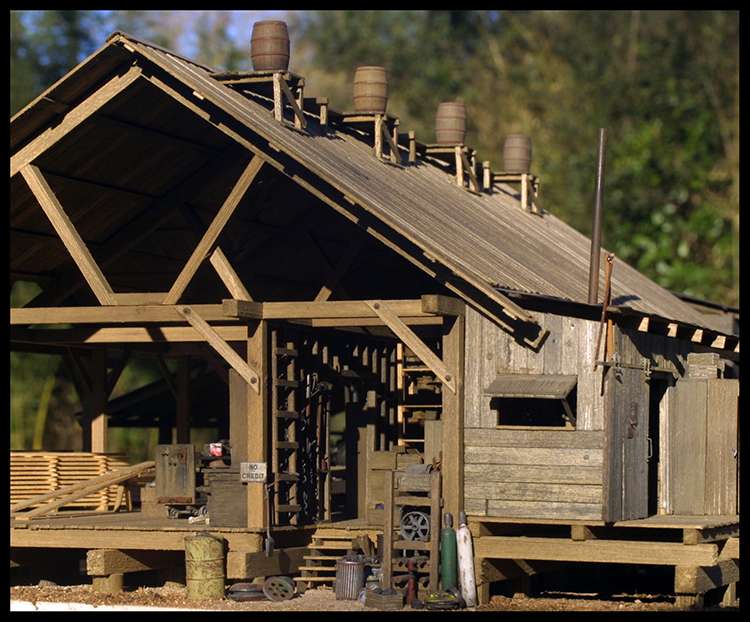 "Lets take a 360 degree tour of the diorama in the brilliant Fall sunlight"
Let's start with the log unloading area, platform, and elevated sawdust bin. The unloading platform was modeled after a photograph of Sturgeons' circa 1920. Sturgeon's has been around along time and there is a lot of information and photographs available online. I am so pleased how I was able to blend different era's into the final diorama using Boone's plans and the extra information from the internet. SierraWest kits are so much more than a structure and a details. The diorama creation is paramount in the development of each new kit. Instructions are provided leading you through every phase of construction including tool selection, assembly, weathering and aging, diorama composition, and scenery application. 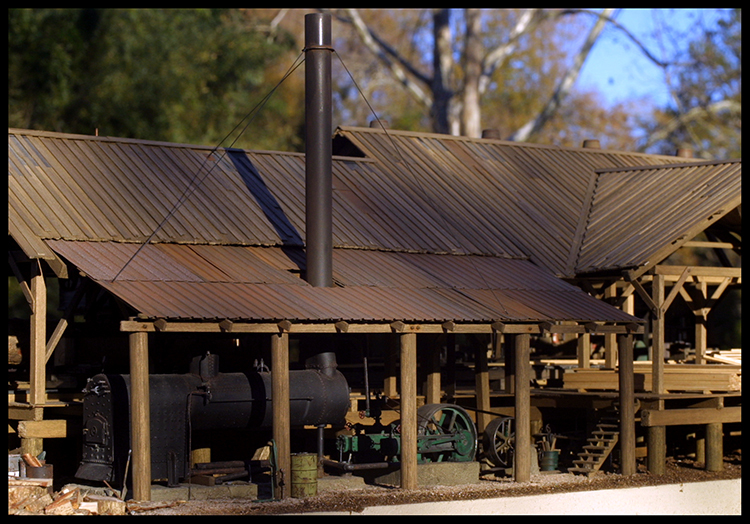 When you view the pictures of the sawmill diorama remember this. SierraWest kits are unique in the level and amount of detail provided. Since all four sides are fully detailed, you have a ton of flexibility in placement and viewability. The "business" end of the mill. Logs are stored on the rollway awaiting their turn to take a trip on the carriage. The pier and beam sub-floor assembly of the mill is constructed in layers (as is the whole structure) making the assembly easy. I love the heavy timbers and large iron nbw castings supporting the carriage drive and stop. This scene is so interesting with all of the discarded slab. My famous comprehensive instruction manual and digitally reproduced accurate templates guide you thoughtfully along the construction process. I consider myself a teacher in addition to being a manufacturer. My manual provides guidance and confidence building techniques allowing you to reproduce the results pictured here. I am so proud of the number of customers who have won major national awards with the SierraWest kits they have constructed, following the provided instructions! 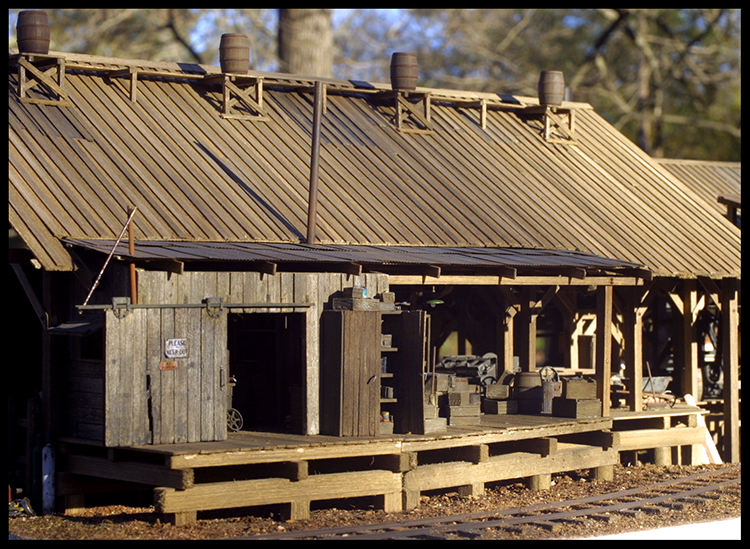 The Mill Engine and Horizontal Boiler housing dominates the rear of the mill diorama. 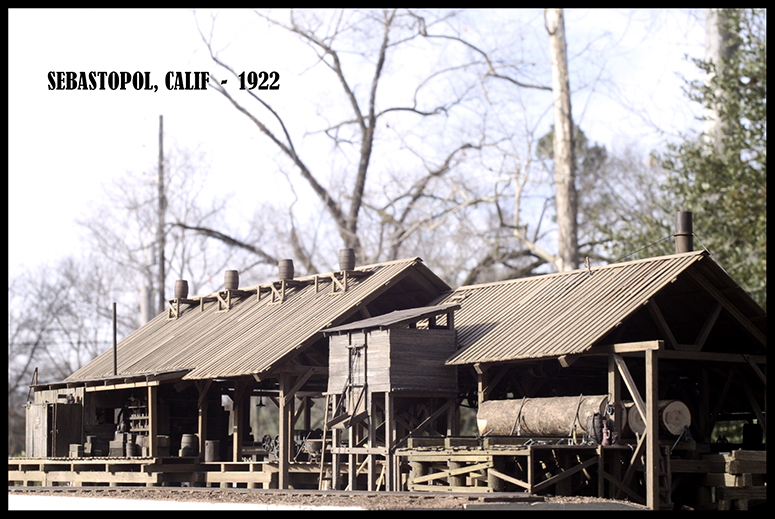 One aspect of the sawmill diorama that is so compelling is that every angle, corner, and view tells an important, prototypical story about logging and sawmill operations in North America. The cement foundations are resin castings and are loaded with detail and character. All of the various piping, belts, and walkways intermingled with the natural junk and clutter create an incredible scene. It is realistic detailing like this that makes modeling so interesting and keeps me active in the hobby. I find that creating scenes and telling stories is paramount in importance if I am to model a scene that viewers are interested in. When an entire layout is created with this philosophy then the true magic of modeling emerges and a storyteller is born! 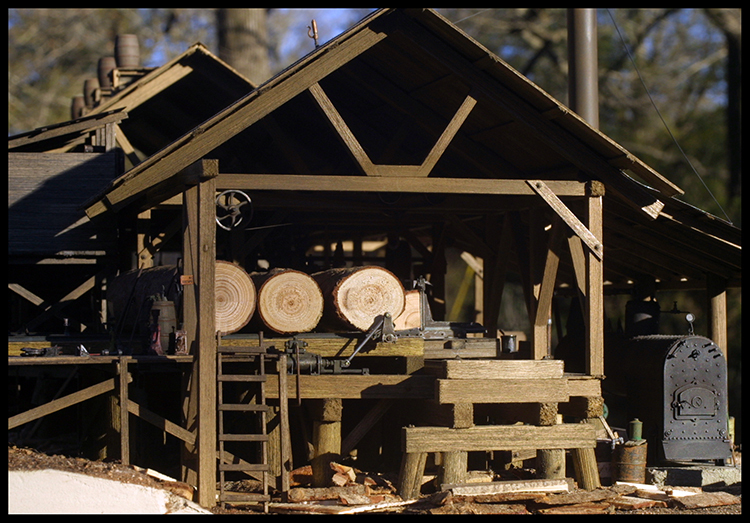 The sawmill diorama is one natural focal point for any logging layout wanting to embrace this philosophy. The lumber sorting platform and office are both very busy scenes. The office end of the mill is loaded with well researched details and clutter typical of a small hometown mill. The old wooden desk, bookshelves, metal locker, and rolling repair cart create the perfect atmosphere. 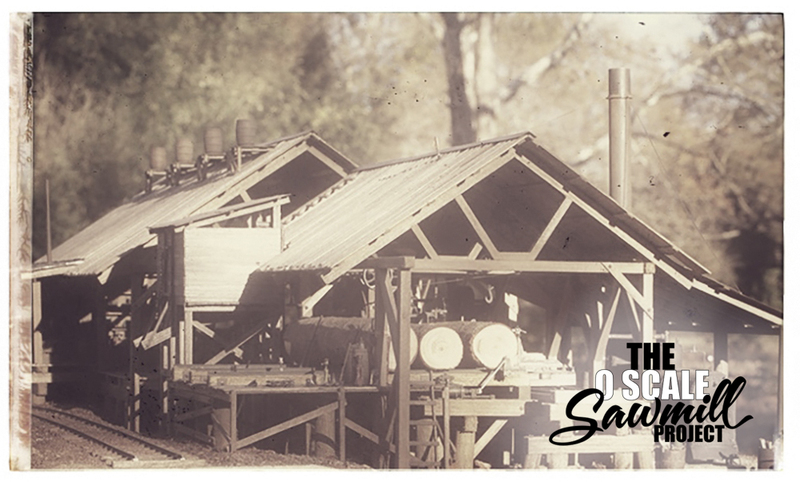 The sawmill diorama is a prototypically cluttered operation that includes stacks of cut, sorted, and graded lumber ready to ship out. I am always pushing myself to set new standards, create new construction techniques, and improve and refine weathering and scenery methods. All this in addition to designing, creating, and manufacturing better castings, along with writing more precise manuals and templates... well you get the idea! I think my favorite scene on the diorama is the storage area with the belt and shaft wheel rack. This uncompromising level of detail is just one aspect of kit manufacturing that SierraWest has been known for since my first kit release way back in 1994. The " No Credit" sign was seen in many prototype photographs of Sturgeons' and just begged to be included in the kit. The storage area includes an outside portion with steps leading to an interior room filled with wooden crates, cardboard boxes, and shelving. Next up is the maintenance shed. The front loading dock and maintenance shed completes our 360 degree tour. The maintenance shed is constructed from reclaimed barn wood and is weathered differently than the other wood used to construct the mill. I love the variation in texture and color. It tells a story and aids in the creation of a prototypical scene. The manual focuses on creating believable scenes using weathering and finishing techniques that are time tested, proven, and easy to master. Readily available materials no matter where you live are utilized in all phases of construction. Complete and detailed plans/templates, comprehensive 134 page spiral bound construction manual, all castings pictured (except the sawmill machinery) brass wire, styrene, nut - bolt - washer castings, brass chain, a dead rolls extension, lamp shades, tarpapers, color signs, corrugated and ribbed aluminum sheets, some wood doweling and some stripwood.This is the most detailed sawmill ever released. Accurate and meticulously designed following the prototype drawings. Tons of brand new castings create visual interest and fantastic scenes like the office, storage and maintenance sheds, loading dock, and log loading rollway. 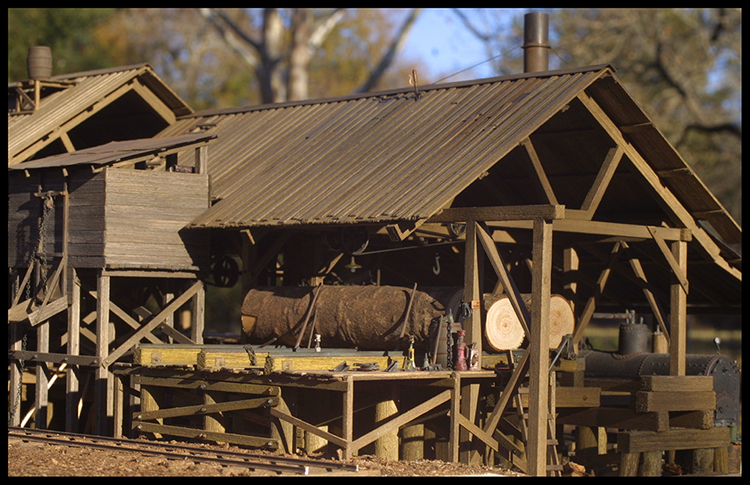 I spent weeks mastering new detail castings just for the sawmill. 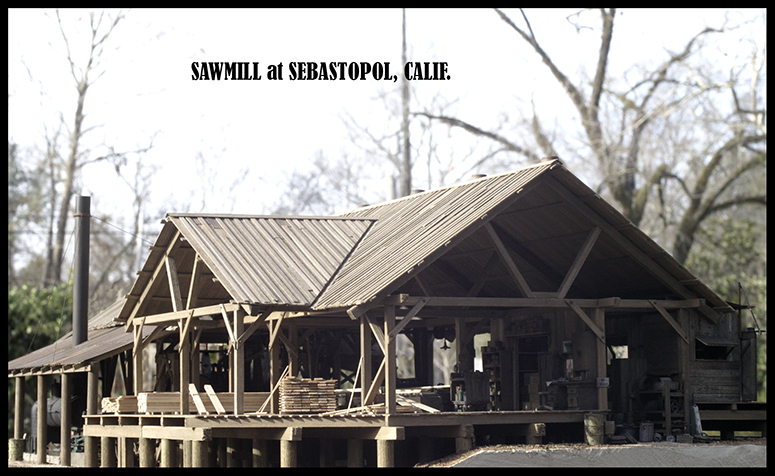 The sawmill is straight forward to construct even though it appears complicated. Layers of details are built upon one another in an orderly and logical manner. Templates and my famous spiral bound construction manual lead you through each phase of assembly with my usual emphasis on realistic and natural weathering. The White Metal and Resin castings necessary to construct the Double-Blade Circular Saw Husk, Carriage, Carriage Drive and Sawdust Blower, Log Turner, Live Rolls, Dead Rolls, Cut-Off Saw, Log Deck, and Edger. This kit also includes the Double Cylinder Mill Engine and Stationary Horizontal Boiler. These are all of the machinery pieces used in the "Project". Please note you will need to supply a small quantity of stripwood and brass wire to complete the machinery kits. A complete list is included. All of the stripwood necessary to complete the "Project" along with doweling for the pier constructioin and weathered rail for the carriage drive. You may choose to supply your own stripwood and a comprehensive list of the required pieces is included with each kit. The attention to the smallest detail is evident. The story telling is paramount in the development of each new kit. Instructions are provided leading you through every phase of construction including tool selection, assembly, weathering and aging, diorama composition, and scenery creation and application. It is of the utmost of importance to me that the techniques I develop and utilize are reproducible for modelers of all experience levels. When you view the pictures of the Sawmill remember this. SierraWest kits are unique in the level and amount of detail provided. Since all four sides are fully detailed, you have a ton of flexibility in placement and view-ability.